Do you want to set your home up as the place in the neighborhood to spend fun evenings? The old saying goes that a way to a person's heart is through their stomach. Creating a barbecue area in your backyard is the key to making your parties more memorable and entertaining. 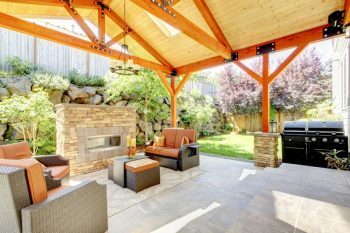 From practical tips to ideas for outdoor lighting, decoration, and more, this article shows you what you need to know for the ideal setup. Barbecues - what type of fuel to use? It's a debate that's never going to end. Which type of fuel do use in your grill? Many folks have a preference and tend to stick with it through most of their lives. If you're not sure about the different types of fuel to use for getting the ultimate steaks, burgers and brats, check out the list below. Propane: Fans of propane like that it delivers an instant flame. All you have to do is open up the gas, push a button and you're grilling. The flame is very clean, with fewer emissions than other fuels. This allows you to taste more of the meat's own natural flavor. Charcoal: Small briquettes of carbon, charcoal is a long-burning substance that that provides a hot flame for finishing off your meat. Proponents like the added smokiness compared to propane. There are also fewer issues with transporting and storing charcoal compared to gas grills. This type of fuel is also better suited for use i small hibachis and other compact barbecues. 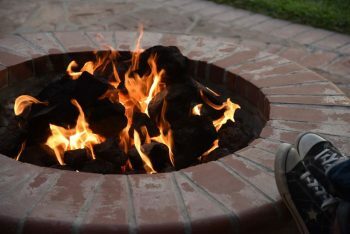 Wood: Most grillers don't use regular wood as a fuel in their fires. It has the advantage of creating aromatic smoke that enhances the flavor of your food. If you want the taste of wood smoke but prefer charcoal or propane, you can use special wood chips as part of your grilling process. Once you're set up to cook, you're only halfway done. Anyone can install a grill; what you need is a signature look to set your party space apart from the rest. Options include lighting, landscaping, furniture and more. The real party doesn't start until the sun goes down. Adding the right type of outdoor lighting enhances any event. The basics are very obvious. Use downward illumination set up around walkways to clearly illuminate the path for your guests. Solar stakes are an environmentally friendly option, as they have panels on top that draw power from the sun during the day, negating the need to run them off of your electrical grid. The sensors also activate the lights when it gets dark out, ensuring that your guests always have a clear path. In order to see what you're doing, set up lights above you. These can be as simple as hanging lanterns, or you can go for more permanent installations.There are many options available for colors, including programmable color changes that allow you to set the mood for each event. Sculpt your backyard just how you like it to create an expression of your personal taste. You can take inspiration from Scottsdale's hot setting. working with the landscape instead of against it. Opt for a rock garden to incorporate the stark look of McDowell Mountain and its surroundings. This also relieves you from having to water the lawn regularly. You can apply the water instead to a pond feature or waterfall, creating a place of tranquility and a relaxing effect in your backyard. A well-placed tree or two offers fresh air, shade from the sun and a place for birds and other critters to gather. You can also run lights up in large tree branches for an effect that combines nature with man-made design. Trees are often simpler to care for than a lawn or a flower garden and go a long way towards adding beauty to your property. If you want a party space in your backyard, you need an area for people to sit and eat. Try to set up space for between eight and 12 people to sit. You can always add more seating later if you need. Look for coordinating sets that include dinner tables, perhaps a fire pit and maybe storage bins. If you want to really coordinate things, try to get your furnishings in the same color as your barbecue grill. A common finish for chairs, tables, grills, and other elements is black oxide, the color of wrought iron. Even if you don't plan to use it, setting up a hammock adds a casual touch to your outdoor environment. As spot for common lawn games, such as croquet, volleyball or badminton, turns your yard into place where you can stay active and enjoy some fresh air. Consider adding a patio cover to create a shaded area where you can beat the heat in the breeze. Desert Environments is one of Scottsdale's most experienced landscaping, decorating and outdoor lighting design firms. We work with a wide range of clients from all sorts of backgrounds with with differing interests. We work at multiple budget levels and at scale. To find out more about our services give us a phone call or fill out this site's contact form. We set up a free consultation to discuss your needs and what we can do for you. 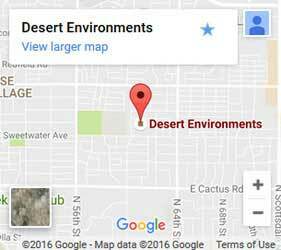 Here at Desert Environments we've been in business for over 25 years. In that time we've built a reputation for quality and consistency, but also for brilliant and innovative design. If you have a property developed by Desert Environments you're the envy of the neighbordhood. Put us to work for you today and make your dreams a reality.